The FAARM project has adopted the PLA- LANN approach. PLA- Participatory Learning and Action lies at the heart our community mobilization strategy and LANN- Linking Agriculture with Natural Resource and Nutrition is how we understand the impossibility of securing nutrition without seeing through how intertwined agriculture and natural resources are with health and nutrition for the adivasi and forest communities in Odisha. The whole program is designed giving importance to the agency of the community and to create an environment where the maximum exercise of it is possible. This is important because such a model aims at making the intervention organisation’s role lesser and lesser as the engagement with the community continues. We say this because, PLA approach requires the facilitators to mobilize the community so that they identify the problems and difficulties (in our case problems around health and nutrition) in the village and feel deeply moved and disturbed enough about those for them to collectively come up with strategies and the willingness to take steps towards addressing their own problems. It is only when there is honest mobilization that there is true participation. Such kind of participation allows the facilitators to help the community navigate through various strategies of securing nutrition and explain how malnutrition affects people and what are the factors that are a threat to their nutritional status. FAARM project has a series of 17 PLA- LANN meetings that are facilitated in the villages each in a month where people come together to discuss different factors causing malnutrition and the ways in which malnutrition can be addressed through agricultural practices and collection of uncultivated foods from the forest. 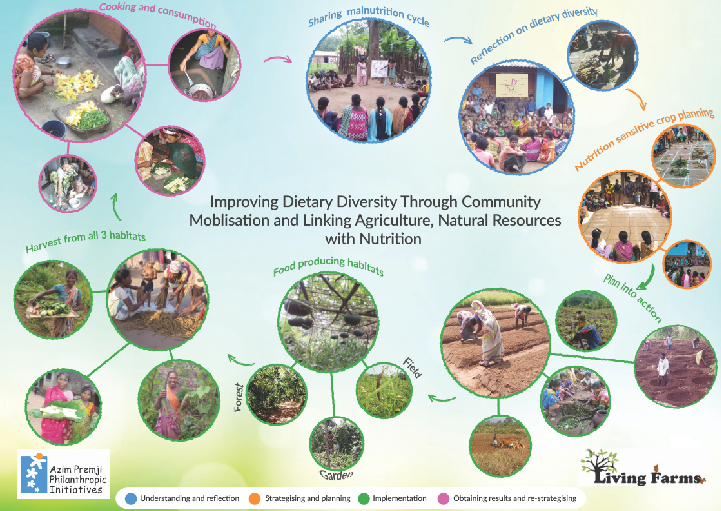 Thus the community members Learn and Reflect on the various topics discussed in the meetings and make decisions specific to their own villages to improve their nutrition status, increase their dietary diversity and avoid recurrence of diseases. These decisions are recorded and then followed up by the facilitators to maintain the momentum and keep the community mobilized. This method is chosen specifically with the understanding that our partnering Adivasi communities possess valuable traditional knowledge of agricultural practices and forests foods which are safe, nutritious and freely available. Over the years agriculture, forest and food and nutrition security are looked at independently which is reflected in the kind of food and nutrition and agriculture schemes and programmes that have been implemented. The increase in monocultures has had an immediate effect reducing the crop diversity and forest foods quality and quantity and further scaling of industrial agriculture with excessive use of agrochemicals have replaced safe and diverse foods. Thus it becomes more than just a tool or technique but a way of engaging, communicating and understanding the link between agriculture, forests and nutrition in order to structurally address the problem of Malnutrition.